Puppies that are aggressive to people can be frightening, damaging, and embarrassing. Fortunately, with knowledge, understanding, and the right approach, most aggressive puppies can find a more peaceful way to behave. This information is intended for owners with puppies under 6 months of age. If your puppy is older, go to 'Aggression To People'. If your puppy is fearful but not yet aggressive, go to ‘Fear And Anxiety In Puppies’ . Aggression can be defined as any hostile act that a puppy (or person) makes towards another. For pups, this can include growling, snarling, snapping in the air, and biting. Before a puppy becomes aggressive, changes in their body language and postures are usually seen (for more information, go to ‘Fear and Anxiety In Puppies’). Before snarling or bites occur, puppies will often growl. Growls should be seen as an early warning of increased aggression if your actions continue (for more information, go to ‘Puppy Growling’). It is rare for a very young puppy to bite, but they will do so if they feel they are in danger. 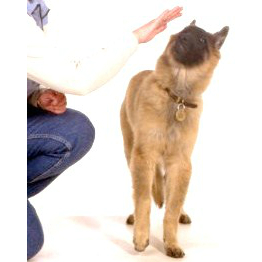 Puppies take time to learn to be accurate when using their mouths, just as young children do with thier hands. However, so if a puppy snaps in the air and misses your skin, he probably meant to miss. Puppies are quick, and if they want to bite you, it’s unlikely that you will be able to move out of the way in time. Until they have been pushed into using real bites to keep people away, puppies will often snap in the air next to the person as a warning, not wishing to actually cause harm. This is particularly likely with family members who they do not wish to hurt. Occasionally, people are injured as they try to move out of the way of an air-snap, putting themselves accidentally in the path of the puppy’s teeth, even though he never meant to bite them. Puppies do not become aggressive just for the sake of it or at random (unless something has gone wrong inside their brains, e.g. a brain tumour, but this is very rare). There is always a reason why they feel the need to be aggressive, even if it is hard for humans to figure out what that reason might be. Using punishment to stop aggression is not the way to solve the problem. If you are tempted to shout, scold, alpha roll your puppy, shake, or shock, don’t! The intelligent, thoughtful approach is always best in the long run and will solve the problem for the puppy as well as you. Punishment and force usually make aggression problems much worse as the puppy tries harder to feel better. In some cases, severe punishment may intimidate a puppy into stopping aggressive behaviour but it doesn’t solve the underlying problem, which is just waiting to resurface, sometimes with increased ferocity when the circumstances are right. If your puppy is aggressive and you want a solution, it is important to find out the motivation behind the aggression. Once you know why your puppy is being aggressive, you can solve the problem for your puppy and teach it to behave in a more acceptable way. Puppies may be aggressive for more than one reason, but each motivation is distinct and separate. This is the most common cause for puppies to be aggressive. Fear of owners or strangers – This is the most common reason for puppies to become aggressive to people. Puppies need time to learn that people can be trusted, particularly if they came from a breeder who did not take the time to socialise them (go to 'Socialization'). Puppies cannot tell you when they are afraid or worried with words, so if you ignorS their body language, their only choice (in their minds), if they think they are in sufficient danger is to become aggressive. For more information about fearful puppies, go to 'Fear and Anxiety In Puppies’. Fear of being handled – some puppies find it difficult to cope with being handled by humans either though limited experience or from a frightening/painful experience in the past. Puppies need to be taught to trust that we won’t hurt them and humans need to learn how to handle puppies in a way that does not upset them. For further information, go to ‘Problems When Being Handled’. Although puppies that play-bite are just trying to get humans to play, some owners may think that the puppy is being deliberately aggressive. If your puppy tries to bite your hands, fingers, clothing or feet when it is excited, it is probably just play-biting. Play-biting is common in puppies that have not yet learned how to play with toys. 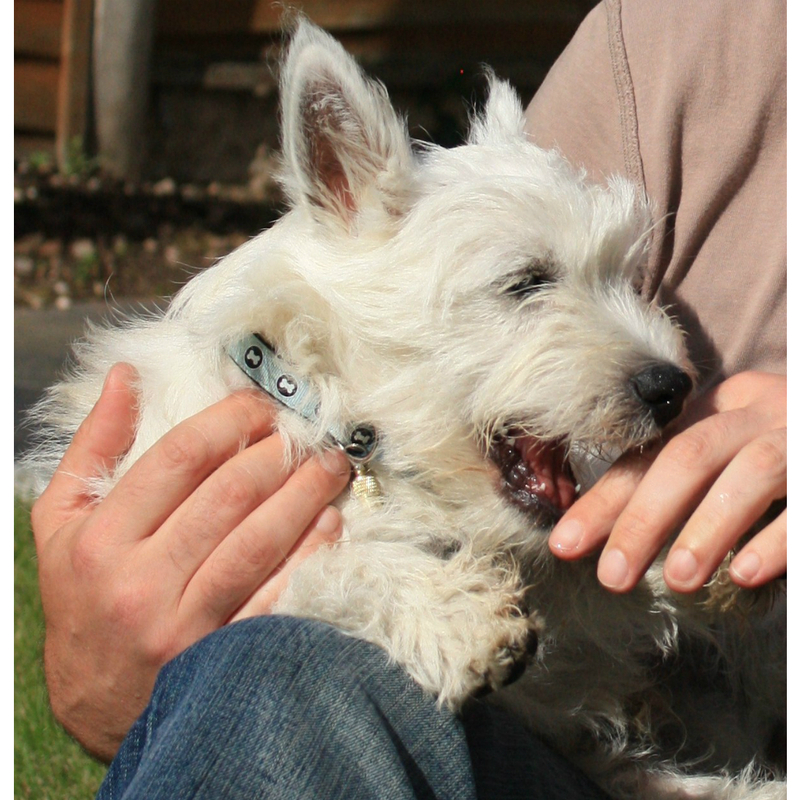 For further information, go to ‘Puppy Play Biting’. Puppies may be aggressive to keep food or items they value. Things they value can range from a stolen sock to food in a dish. Possessive aggression is made worse if there was a shortage of the valued items in the litter and the puppies had to compete with each other for them. For further information, go to ‘Aggression Over Food And Possessions In Puppies’. Some puppies become aggressive when they cannot get their own way. They may threaten or nip or bite to remove restraining hands or leads. For further information, go to ‘Frustration And Re-directed Aggression’. Puppies may become aggressive to those around them if they are restrained or held back from something they want to be aggressive to, such as another puppy they want to play with. For further information, go to ‘Frustration And Re-directed Aggression’. Some puppies resent being moved from where they are resting or sleeping and may use aggression in order to be left alone. For further information, go to ‘Aggression On Being Moved’. Puppies may become aggressive if they are not feeling well or if being touched or handled has become painful. All puppies that are showing signs of aggression should be checked out by a veterinary surgeon immediately, and also before attempting any behavioural modification. Please make an appointment for your puppy to see a veterinary surgeon.